September 2 marked the anniversary of the death of Nikolai Frederik Severin Grundtvig, who died in 1872. 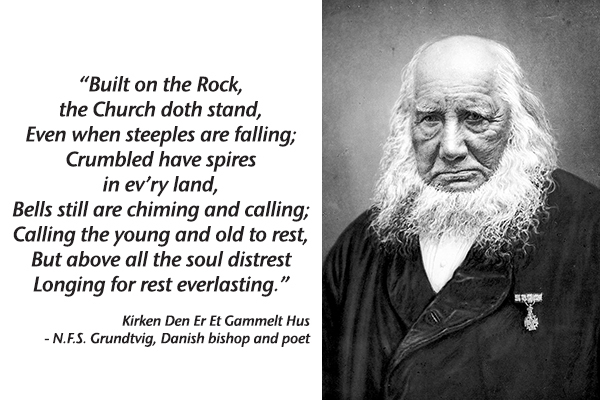 Grundtvig was a brilliant scholar (of Norse and Anglo-Saxon literature), an accomplished poet, an important education reformer, and Bishop of the Danish Church. 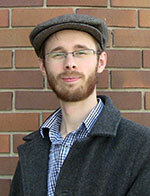 “In 1826, Nikolai was forced to resign his pulpit after he made a blistering attack on the rationalism of H. N. Clausen. By this time, Nikolai was already well-known for a study of Northern mythology in which he argued that poetry speaks better to mankind than prose and is the best medium for conveying spiritual truth to the soul. Although he attacked Schelling and other philosophers for the false ideas of Romanticism, he himself was thoroughly Romantic, and translated and introduced Anglo-Saxon and Norse literature into Denmark. This included Beowulf and the sagas of Iceland. He also wrote religious poems, sermons that called for a return to the spirit of Luther, and fervent Christian hymns…. Captain Thin is powered by	WordPress 5.0.4 and delivered to you in 0.460 seconds using 39 queries.